The SAFE STRIP project “Use Cases” (Click here to download) are now available after having finally been agreed upon. 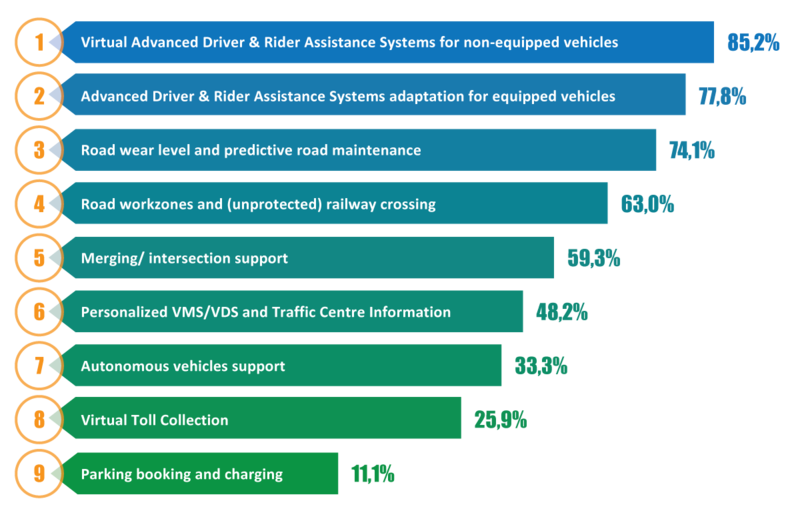 The Use Cases were defined based upon a user-centered approach and aim to reflect all road users’ needs and requirements. The selected Use Cases result from the integration of innovative sensors in road strip markers. Both C-ITS and legacy ITS services are supported by the SAFE STRIP Use Cases. They were developed based upon the results of the project’s on-line survey, in-depth interviews and its Pan-European workshop earlier this year. There are 9 Use Case clusters in total, each one corresponds to the target applications of SAFE STRIP which will serve as proof of concept. The Use Cases can be seen in the diagram below. The Use Cases will be used throughout the project and serve as a reference point for all development and demonstration and pilot activities.